The skin is a complicated organ, and while everyone has it, the issues that we encounter are as varied as the population is large. For some people, skin becomes dry and blistered, while for others it is a challenge to keep skin from growing oily. Acne is a common problem, but it is only the top in a long list of conditions that can cause skin issues. Sun damage can worsen trouble with your skin, but for some, a little bit of sun exposure can actually help alleviate some of the itchiness or redness that appears on the skin. If you want to love that skin you are in, then you need to know how to treat it right. Working with a dermatologist is the best way to gain heightened understanding about the most common skin conditions, and to find the best treatment for any skin concerns that are affecting you. Acne: We said it above and we’ll say it again—acne is one of the most common skin problems. Teenagers may think they have the strongest claim to this problem, but the reality is that puberty is just the start of your problem with pimples. Acne can develop for a wide variety of reasons, and there are many treatment options that can work to alleviate acne issues, regardless of your age. Eczema: While eczema is typically used in a way that would denote a singular medical issue, the concern itself is actually more of an umbrella term to describe a series of skin issues that can fall into this category. There are three common forms of eczema: atopic dermatitis, which causes itchy rashes to develop in the elbow and behind the knees, allergic contact dermatitis, which causes rashes to develop after exposure to environmental factors, like perfumes or metals, and nummular dermatitis, which causes red, flaky coin-like patches of skin to develop without any apparent cause. Seborrheic dermatitis: This skin condition isn’t talked about as frequently because it isn’t as visible. This causes red, oily patches to develop on the scalp—meaning it is frequently under the hair. Skin cancer: The most concerning skin condition due to the nature of cancer, this condition can develop anywhere on the body. Your risk of cancer increases the more often you spend time outside. The American Academy of Dermatology estimates that 1 in 5 Americans will develop skin cancer at some point in their life. Psoriasis: Being another common and chronic disease, psoriasis is caused by a buildup of excess skin tissue in red and thick silvery patches, often beginning on the elbows and knees but eventually reaching other parts of the body. Medications for psoriasis are available through your dermatologist. 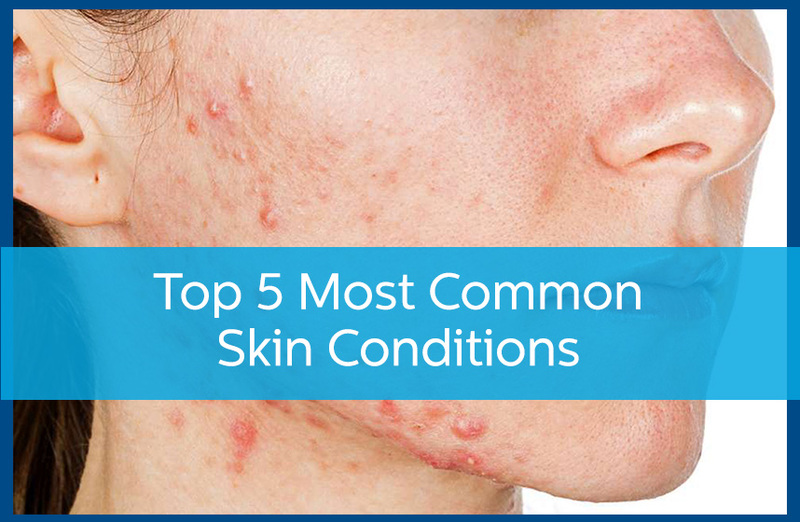 Skin conditions are a common problem, but you don’t need to live with them forever. Talk to your dermatologist about treatment options. Learn more about how Avail Dermatology can help you by calling 770-251-5111 or by scheduling an appointment with us today.